Unbridled leads the way with trendsetting, show stopping styles for the free-spirited Western fashionista. Cute, casual and comfortable. Perfect for strolling around town. Ariat strives to redesign, reimagine, and reshape our world, while staying true to the values and traditions that keep them authentic. Ariat western boots are the perfect boots for little cowgirls. Kick off your boots and slip into the casual comfort of Cruiser shoes by Ariat. Meet your perfect stroll-around-town pair. Meet your perfect stroll-around-town pair. A timeless western boot, finished with classic detailing and advanced comfort technology. Kick back and relax in these stylish castaway shoes from Ariat. Western craftsmenship and striking stitched details combine beautifully in a boot made especially for young riders. These boots are cool in every sense of the word. These boots are cool in every sense of the word. This is an awesome rough out boot with riding heel for kids! 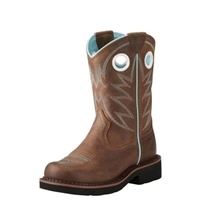 Get your little cowboy rodeo ready with the stylish and comfortable Hoolihan Alamo boots from Ariat. 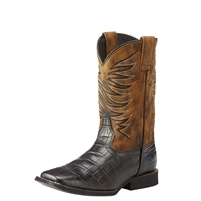 Show your patriotic pride in these sharp ladies Western boots from Ariat. Bruin brown full grain leather foot. The Ariat Fuse Collection blends sport and fashion with stylish, athletic designs and innovative comfort to re-energize tired feet. Have your little rider steppin' out in style with these Ariat Relentless Youth Unrivaled Black Boots. Pull off your boots and slip into the Cruiser from Ariat! Pull off your boots and slip into comfortable casuals from the Rugged West collection. The Ariat Spitfire Chukka Boot combines vintage-rugged style with casual comfort. This lightweight shoe features the innovative 4LR™ technology that delivers outstanding support and comfort throughout the day. Furthermore, an EVA midsole and the Duratread™ outsole combine maximum wear-resistance with comfort and flexibility for lasting performance and protection.